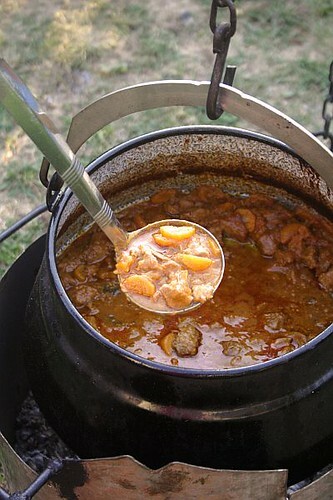 In Hungary, Goulash is called Gulyás. It is one of the world’s most famous dishes and has many regional varieties. 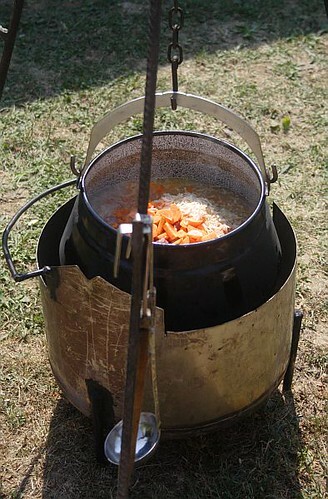 The most popular version in Serbia is Goulash cooked in a cauldron, over an open fire. Actually, it is more a Pörkölt with added vegetables, but I’m publishing it as Goulash, as that’s how we call it here. 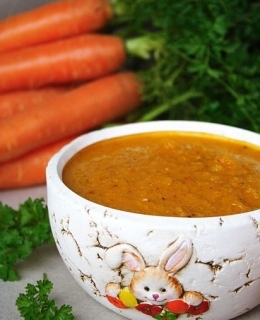 There is no actual recipe for any dish made in a cauldron. There are some basic directions and the rest is up to you and your taste. There is no way it can go wrong. And, of course, the most important ingredient are your friends. Mamajac came over with her husband and two adorable sons to help us eat all the food There you have it – a recipe for a perfect summer day: good food + great people. First, you’ll need a cauldron. This one has a custom made “tank” for the wood, made by Mateja’s uncle from an old water heater. Chop 5-6 onions and 1-2 heads of garlic. Saute on some oil until it softens. Even better, saute it on pork fat. Add about 2 kg of diced beef, 5 chopped carrots and a grated half of one small celery root. Pour enough water to cover all the ingredients and continue to cook until half of it evaporates. Each time when liquid reduces, pour more wine and/or water. For this amount of meat you shouldn’t add more than 1 l of wine. When you pour all the wine, continue with water only. After about an hour, add celery and parsley leaves and a branch of rosemary. At this point, it is almost done. All you have to do is let it boil easily, add more water and season when and if needed. 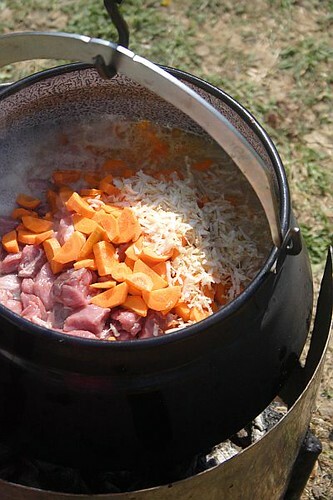 Remember this – anything made in a cauldron over an open fire is better when you cook it for a very long time. The meat should be soft enough to melt in your mouth. This is usually served with some cooked pasta, but I like it with bread more. And for this occasion, mamajac made us her Belgrade Fair-Style Tortillas that were perfect! 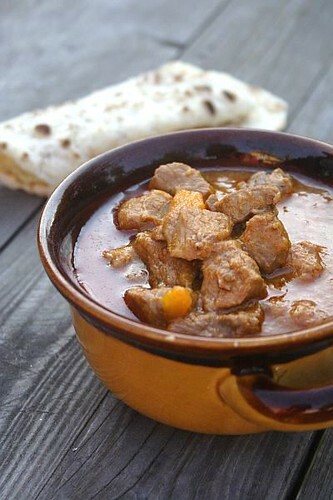 You can prepare this goulash with lamb, pork or game meat. You should only be careful if making it with game meat – game MUST be marinated overnight, otherwise it won’t be soft. I really enjoy Goulash, very easy to make and so good to eat. Nice picture with the kids! Looks great! I guess it is very similar to our stew. Yummy! Goulash is one of favorites. We usually start having it when the weather starts to get cold. I was getting worried because I hadn't seen a post from you in TEN DAYS!! !BTW is the FBI Gloves thing still on? 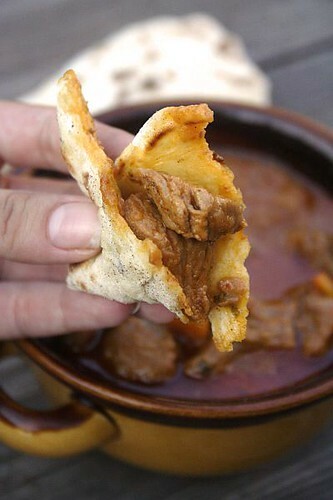 delicious goulash, I would love to have a bowl right now. yum! @Heaven on Earth – Thank you so much for thinking of me, you're so sweet! I;m having troubles with my computer and internet connection, plus it's been incredibly hot, and I just didn't cook much. As for the FBI, I had to pause it, nobody wanted to participate Maybe later in the year. Looks wonderful. I love anything that is slowly cooked like this. This looks really great! I love goulash, but doubt I have ever had a really authentic version! 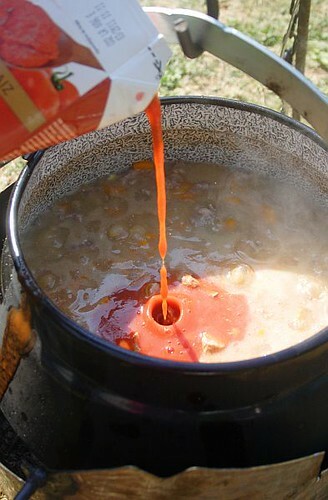 cooking Goulash outdoors looks totally awesome! Mmmm, kako je bio dobar! Slike su fantastične, gulaš boli glava, rastu mi zazubice !!!! I wish I could have joined you in this goulash feast! 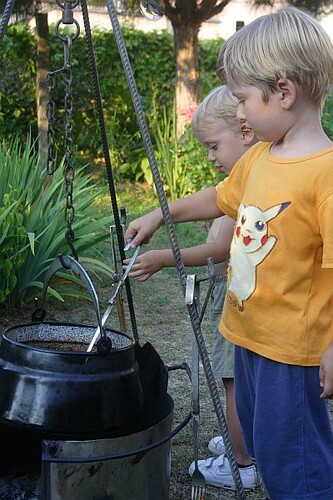 I like the whole cauldron cooking technique, which I have also seen done over at Zerrin's blog, Giverecipe.com which is from Turkey.I really hope to be able to create some kind of cauldron for cooking this fall & get to try it.Thanks Marija for a beautiful, traditional recipe with pictures. Love your attitude, friends as ingredients! Wish we could have the some way of cooking here, where space is a premium no matter indoor or outdoor. Predivno izgleda,o ukusu ni ne sumnjam,pozdrav za obe! Where did you buy your cauldron from? Sjajan gulaš i idilična atmosfera. I just had lunch, but am hungry again. Looks delicious and the setting and friends–what a great day! What a big pot of goulash! It looks nice and tasty! WOW…WOW…WOW.First of all, I love Goulash. But the pics with the kids peeking into the pot and the wonderful scenery. Fantastic post!!! @Anonymous – I bought it in Kacarevo. These are usually sold on fairs. 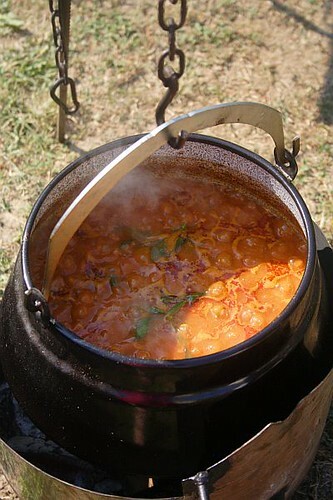 This Goulash recipe looks fabulous! Thanks for sharing this with your foodie friends. 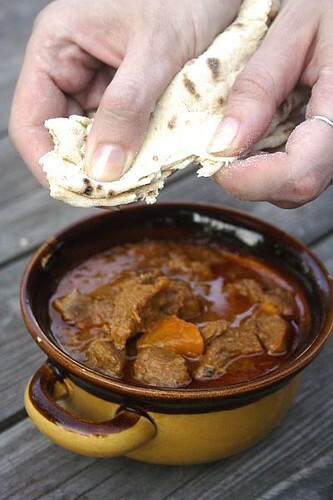 Love, love, love this post, and it makes me very nostalgic for all the mountain huts where I have eaten Goulash in the Slovenian and Austrian alps. 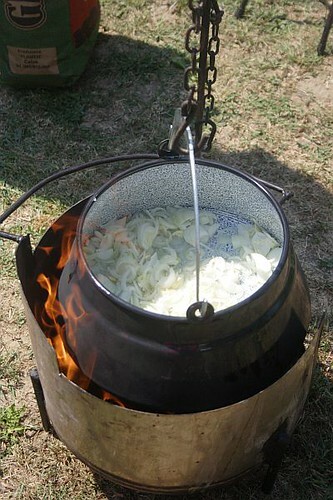 I think anything cooked over a cauldron on an open fire just has to taste fab. Nothing like outdoor cooking with friends! Mislila sam da niko više nema ovakvu skalameriju za kotlić, ali grešim. Pored tog ložionika od bojlera, moj je malo viši doduše, imamo i tzv tanjiraču iz koje se ne zna je li bolji roštilj, kobaje, krompiri ili riba… Šta god da se kuva/peče u prirodi, nema greške :)Fotke prelepe, pozdrav! Wow – love that set-up! Beautiful pictures.